How to benefit from the current gold rally? 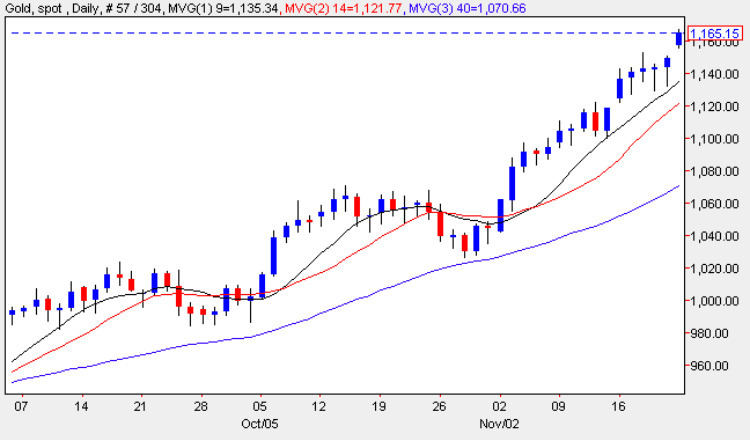 The market today is dominated by the rally in gold prices. The precious metal has already hit an all time record high of $1167 per ounce in this morning’s trading having opened gapped up and a combination of chronic dollar weakness & investor fear is helping to drive the price even further. Gold’s rally has in turn helped other commodities and boosted demand for the Comm dollars – USD/CAD & AUD/CAD. Gold is Australia’s third most valuable export commodity and oil a major part of the Canadian economy. Other currencies which are performing well include the Swiss Franc (USD/CHF) and Euro EUR/USD – these two pairs are inversely correlated so as one goes up the other goes down. The kiwi too is being pulled along by the Aussie & the FTSE 100 has already comfortably breached 5300 & likely to go higher. USD/CHF – if dollar continues to freefall.